The deadline is 5 p.m. on Sept. 6 for both DeSantis and Gillum to pick their lieutenant governors. The news of Ron DeSantis and Andrew Gillum's primary victories Tuesday night is still reverberating around Florida, but already the countdown has begun for both men to pick their running mates for the general election ballot. By 5 p.m. on Sept. 6, both nominees for governor must file paperwork with the Department of State indicating who their lieutenant governor picks will be. While the lieutenant governor position doesn't inherently hold much governing power, the selection represents one of the first major decisions by each nominee and gives clues about which demographics or geographic areas they feel they need to capture to win in November. 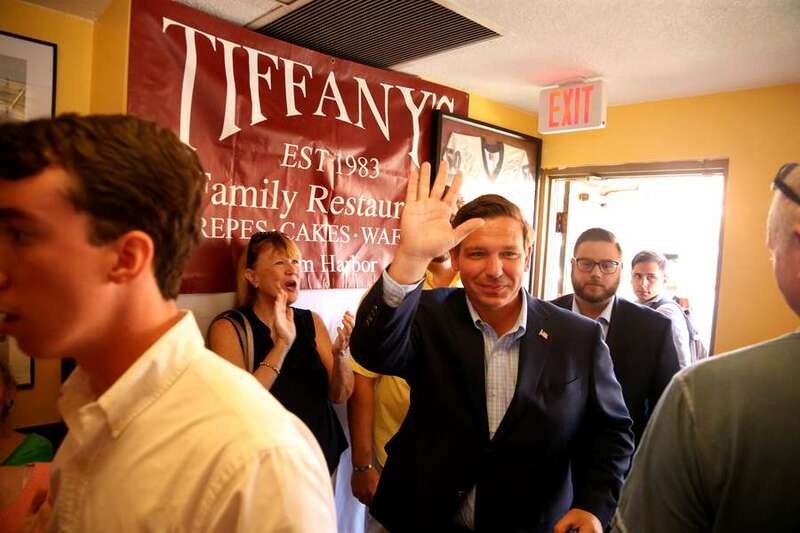 DeSantis is considering a host of Republican state lawmakers, public officials and a judge. An early list of the contenders was first reported by Politico. Several lawmakers whose names have come up were in the walled-off VIP lounge at DeSantis' Tuesday night victory party. One of them is Rep. Bob Cortes of Altamonte Springs, who said as far as he knows, he is still being backgrounded. He added that Gillum's surprise victory over Democratic "frontrunner" Gwen Graham may have changed who the DeSantis team will choose to most effectively counter Gillum's base which includes many minority voters. Cortes is Hispanic. "Gillum brings something different that's harder — like in 2008 with Obama, you're going to get a voting bloc that's doesn't normally come out and in a midterm they're going to be energized to come out and vote," Cortes said. "They (the DeSantis campaign) are looking into a different strategy." Rep. Heather Fitzenhagen of Fort Myers was also in the VIP lounge that night and said to her knowledge, she is still also under consideration. "I think we both care very much about clean water and that's what brought us together," she said of DeSantis. Another potential running mate, Sen. Debbie Mayfield of Vero Beach, was also at the victory party, according to Cortes. She did not return a request for comment. Of the list reported by Politico, at least one has already removed himself from further consideration: Jacksonville Sheriff Mike Williams, who told News4Jax TV station that he is not interested in stepping down from his post. "While it is very flattering to be considered for the post of Lieutenant Governor of the State of Florida, I have made it clear to Congressman DeSantis that my calling is in law enforcement," Williams wrote. State Rep. Jeanette Nuñez of Miami is also rumored to have declined further consideration. She did not immediately respond for a request to confirm. Then, according to Politico, there are State Rep. Scott Plakon (who declined to comment), Kissimmee Vice Mayor Wanda Rentas and Visit Florida CEO Ken Lawson. Finally, there's Laurel Lee, a Rick Scott-appointed judge who is also married to Sen. Tom Lee, who would only say that he was "contacted by the campaign to inform me that the media was aware that her name was under consideration for lieutenant governor."